I've mentioned before that I have a basil colored thumb, I can grow basil like old bread grows mold. If I didn't find ways to use up all the basil I'd be living in a basil jungle. 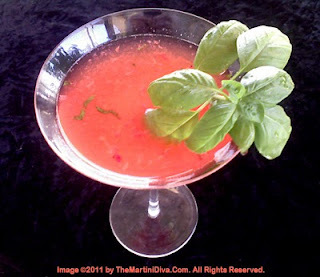 Cocktails are one of my favorite ways to use this herb (as well as on a Margherita Pizza and in Caprese Bruschetta and Salads). Strawberries and lemon both go great with basil so I've combined Strawberry Vodka, Lemoncello and some of the fresh fruit together with my fresh basil for a really nice, refreshing martini.